Custom Concrete Design is Central Missouri’s #1 choice for the highest quality residential garage flooring and commercial garage floor coating solutions. With our high priorities on customer service, professionalism, affordable prices, exceptional high quality products, outstanding workmanship and extraordinary attention to detail and surface preparation, Custom Concrete Design is determined to exceed your highest expectations. Custom Concrete Design employs a cutting-edge, epoxy floor coating solution which creates the most brilliant shine while far exceeding the durability standards of most flooring products. Easy to clean, resisting stains, harsh chemicals, and tire skid marks, our coatings are extremely durable and maintain a long lasting shine. 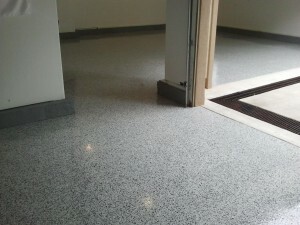 The most common garage floor solution is an epoxy floor with decorative flakes or chips. There are several benefits to adding these to your floor. They are a great source of traction and do not make your garage floor slippery. It is generally less slippery than your normal concrete when wet. With concrete slabs come imperfections in the finish – this means low spots, waves, etc. Normally you can see these imperfections well, however, when a gloss epoxy coating is applied the imperfections are brought to light. The flakes will hide these imperfections and make your floor look beautiful! And, not to mention, the flakes come in many sizes and hundreds of color combinations so you can pick the colors you like best! After the flakes/chips are on the floor at a 100% prod-cast, we seal them in with a super high-gloss performance clear epoxy coat and gives that WOW factor! At Custom Concrete Design, we can adapt our floor coating systems directly to your own creativity. Turn that space in your home or garage into something you can be proud of! Be it solid color epoxy, epoxy with chips, old world acid staining, a clear “wet Look” floor coating, saw cut patterns or custom colors, any custom design you can imagine can be yours. 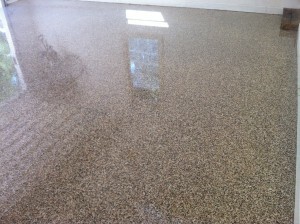 Just call and our team of professional epoxy floor specialists and we will be there to assist you! Whether you are a homeowner who has always dreamed of a beautiful showroom-quality garage floor, a home builder needing flooring solutions that rise above the rest, or a commercial shop needing that 21st century look, Custom Concrete Design help you make your vision a reality!